Company: Sphaeramia nematoptera (Pajama cardinalfish) should not be kept together with zoobenthos and other benth crustaceans. Aquarium Setup: Sphaeramia nematoptera (Pajama cardinalfish) prefers low temperatures, but 72-78 degrees F. is okay. Will tolerate a few tens of ppm of nitrate, but will be healthier in an aquarium with lower levels. They are very sensitive to ammonia and nitrite. Brisk filtration is recommended. 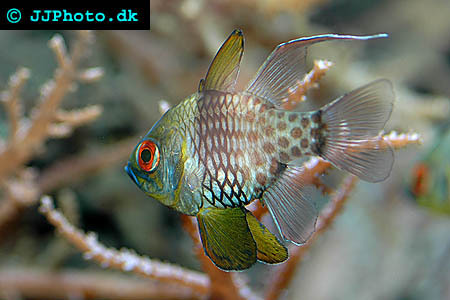 You must provide your Pajama cardinalfish with a dark place to shelter under in the aquarium, since it is night active. Food: Sphaeramia nematoptera (Pajama cardinalfish) eats mianly mobile invertebrates, small fishes, zoobenthos and benth crustaceans in the wild. Small fishes, shrimps and other fresh and frozen meaty foods is a suitable aquarium diet. You can train a Pajama cardinalfish to accept frozen processed foods. Avoid dry prepared foods, such as pellets and flakes. 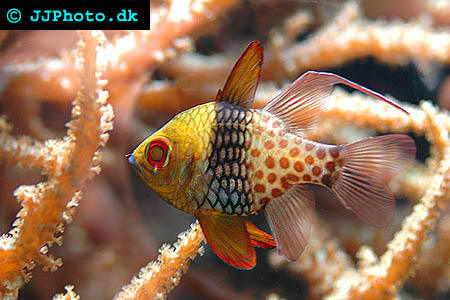 Breeding: We have no information about Sphaeramia nematoptera (Pajama cardinalfish) breeding in aquariums.